Since the Comer Fellows program began in 2004, we've funded field expeditions from Greenland to Antarctica. 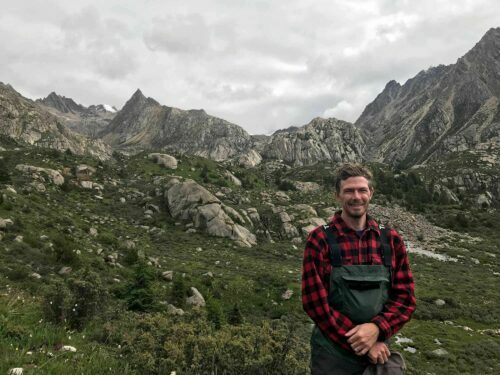 In 2016, Comer Fellow Aaron Putnam received an Early Career Award from the National Science Foundation to study the last glacial termination in interior Asia. The following summer, Putnam led a trip to China that included members of multiple generations, disciplines and countries. 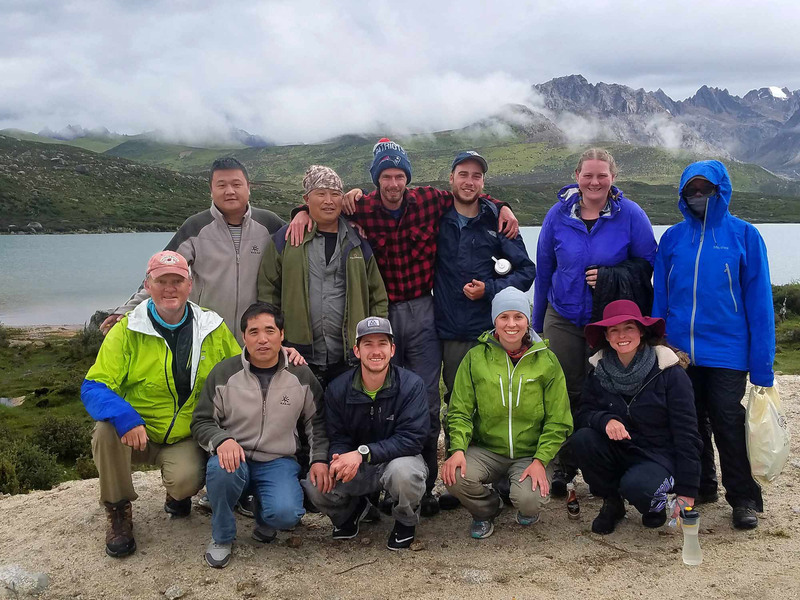 The field team consisted of graduate and undergraduate students from the University of Maine, scientists from the Chinese Academy of Earth Sciences, a high school student and science teacher from Gary Comer College Prep and an embedded graduate student from the Medill School of Journalism. 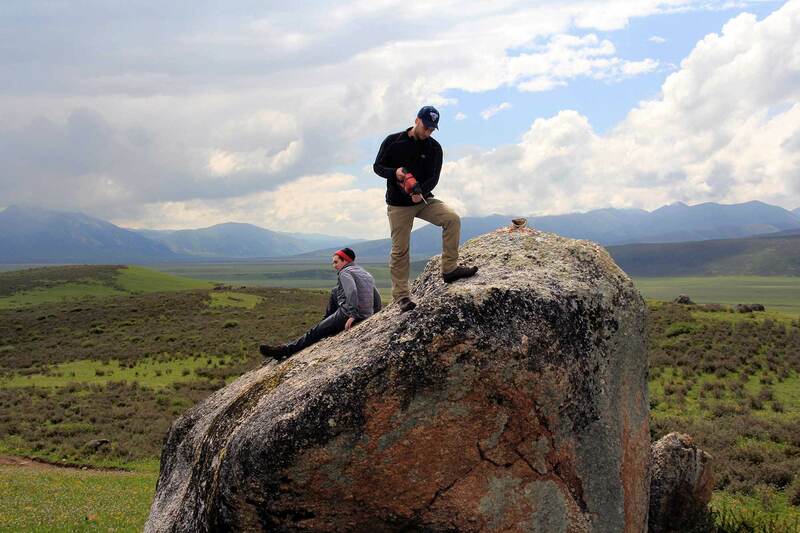 Why do we study boulders? Humans are facing a global environmental challenge that is unlike anything our species has ever encountered. This problem requires an “all hands on deck” approach that involves cooperation of scientists across all disciplines. A major part of the solution is to develop an accurate physical understanding of how our Earth's climate system operates, both under natural conditions and also when perturbed by human-caused greenhouse gas emissions. 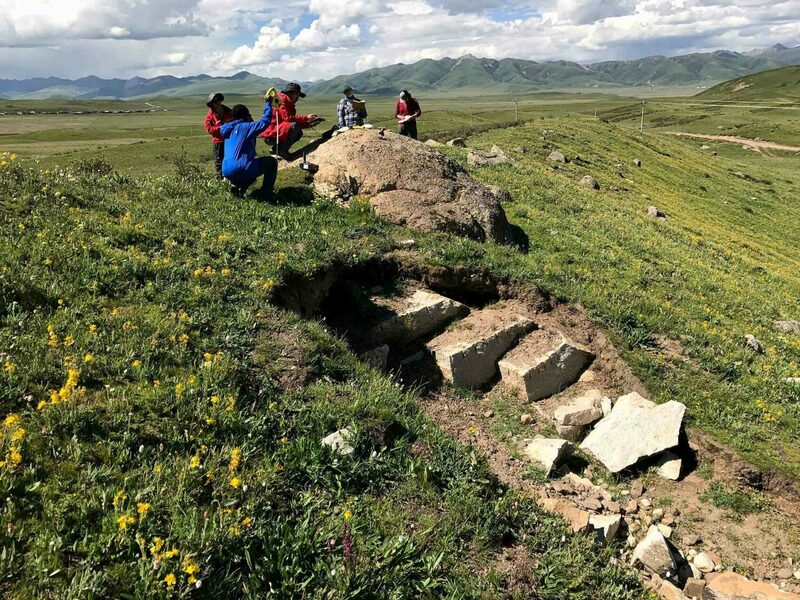 The recent geologic past bears witness to spectacular climatic changes that dwarf anything that has happened during the time in which people have been collecting meteorological data. Aaron Putnam en route to the field site. We study such climate events to learn about how the system operates and improve our grasp of the physics involved. The most spectacular of these past changes was the end of the last ice age - sometimes called 'the last glacial termination.' This event resulted in disintegration of massive continental ice sheets and mountain glaciers across the planet. As the northern ice sheets fell, global seas rose. Wind and rain belts shifted, resulting in a redistribution of water around the world. The biogeography of the planet completely reorganized. This tremendous event set the stage for the advent of agriculture and the development of modern human civilizations. One might consider the last glacial termination as being the most important climate change in human history. And yet we still don't understand why it happened. Deriving a complete solution to the ice-age problem is of utmost importance for understanding the fundamental physical rules that govern our climate system, and hence how our climate will change with the massive carbon dioxide injections that are resulting from the human burning of fossil fuels. 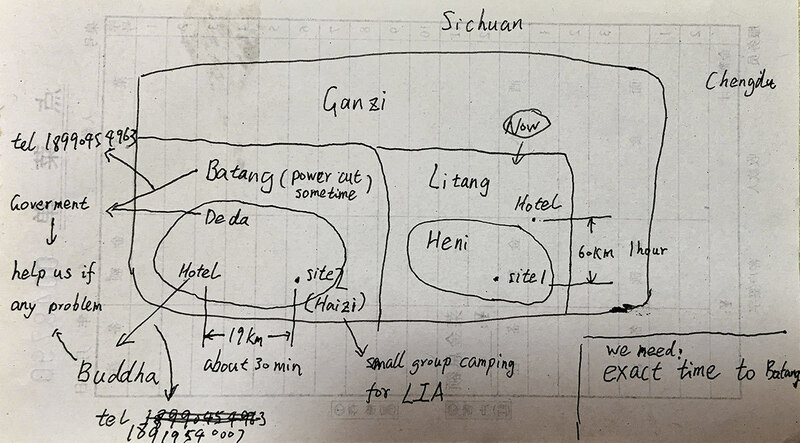 Engineer Ming Li's schematic of the expedition in China drawn on the back of a receipt. We are attacking this problem by developing a comprehensive and global understanding of how glacier ice masses responded to the last great global warming. Glaciers are Earth's most sensitive thermometers. Glaciers expand when the atmosphere cools and they retreat when the atmosphere warms. Perhaps the most iconic measure of global warming over the past century has been the worldwide retreat of mountain glaciers. 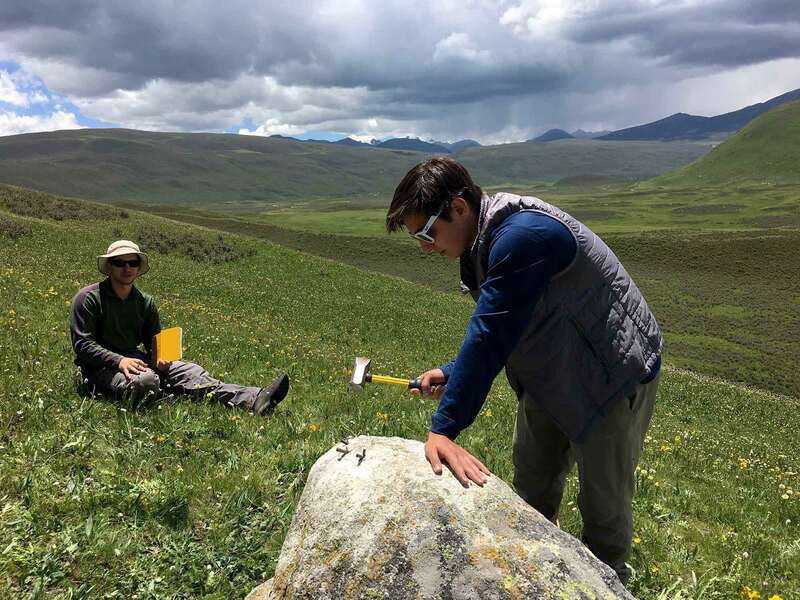 Melt derived from the glaciers and mountain snows of southeastern Tibet constitute an important component of the water that sustains huge downstream populations in Southeast Asia. The glaciers of this region monitor atmospheric heat coming from the warmest waters on the planet in the Indo-Pacific region. These waters, called the 'Warm Pool', supply a tremendous amount of energy to the global climate system. They are considered the earth's 'heat engine.' Any change to the size or temperature of the Warm Pool will impact the temperature of the planet. 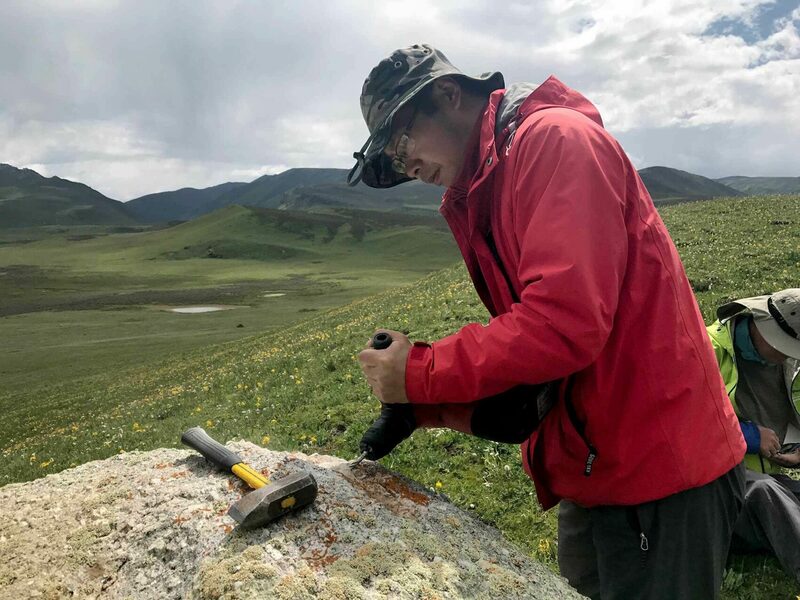 The glacier history of southeast Tibet can tell us about the heat engine’s history over these extraordinary climate changes of the past. By comparing these results to our results from elsewhere around the world, we can learn what role the heat engine plays in amplifying, if not driving, abrupt climate change. Our work is being carried out in conjunction with the Institute of Earth Environment, Chinese Academy of Sciences. Our shared goal is to seek a deeper understanding of the global climate system, with a particular emphasis on the causes of abrupt climate change, and the response of planetary temperature and water resources to abrupt climate change. In addition, we are committed to fostering a mutual, cross-cultural educational experience for the next generation of scientists. This problem will require cooperation among the world's scientists and nations. One of the stunning lessons of this research in conjunction with our work from around the world, is that the global climate system can change very rapidly in response to rather minor forcing. There are almost undoubtedly important feedbacks in the system that are not realized by the current generation of climate models. This is worrisome and demands a rapid effort to unlock the secrets of the past such that they can be useful for training our tools for looking into the future. Our effort is a piece to this puzzle. We also cooperate with the world's top climate modelers to interpret the story the glacial geologic record is trying to tell us. In turn, our glacier records, because of their purely physical nature, can be used as benchmarks for testing and improving the climate models. 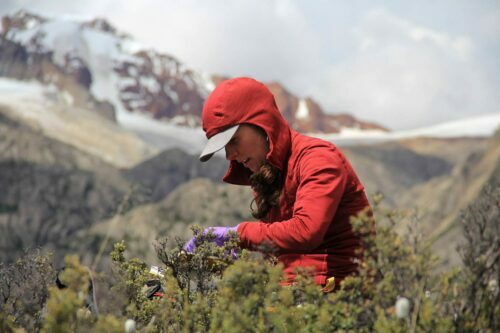 We asked Mariah Radue to explain the role of boulders and how 10Be surface exposure dating is used to determine the chronology of mountain glaciers to help inform our understanding of the past climate record. To glacial geologists, boulders are like clocks. Your watch relies on a quartz crystal at oscillates back and forth at a predictable rate, which allows it to tell time. In boulders, the creation of the element beryllium (Be) is the counter that we use to calculate time. It sounds surprisingly cosmic, but small particles from outer space bombard the surface of the boulder, disturbing the crystal inside and forming Be at a known rate. These boulders become clocks that tell us about the age of a landscape. When did these rocks get here? How long has the surface of this landscape looked like this? These are questions that can be answered by using the "Be clock." 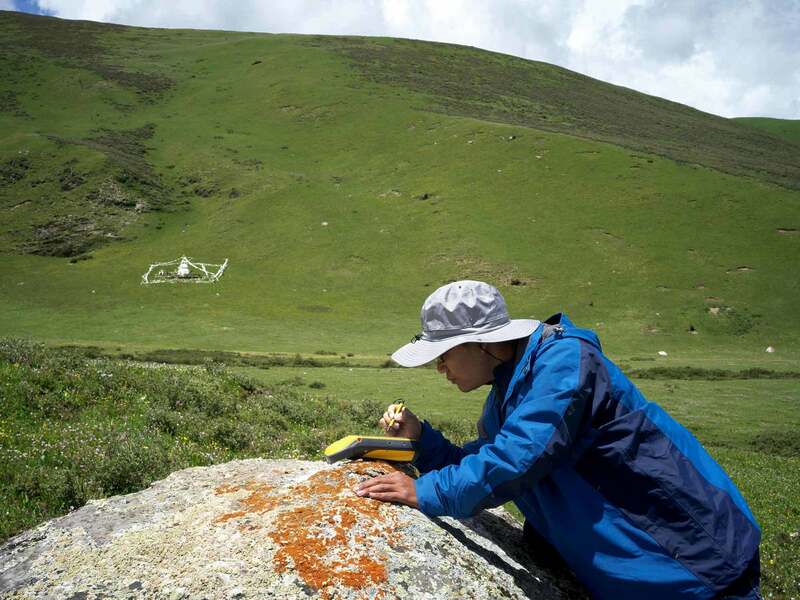 Mariah Radue at a sample site in the Tibetan Plateau. As glacial geologists, we are interested in a specific type of boulder. We don't want boulders left behind after a rockfall or boulders swept up by a large flood; we target boulders that a glacier plopped down. Glaciers are large, excavating, rock tumbling machines that dislodge large hunks of rock from the bottom and erode and polish them, similar to how the ocean smooths sea glass. Boulders travel down the glacier with the flowing ice and get dumped at the edge of the glacier where the detritus from the glacier piles up. The glacial ice eventually retreats, leaving behind a garbage pile of rocks and silt in a small ridge, called a moraine (if the ice gets bigger and advances down valley, the moraine is bulldozed and destroyed). The boulders on the tops of moraines are gold to a geologist because they mark where a glacier was in the past. With the Be clock in each boulder, we can determine when the glacier deposited the boulder. Glaciers reset the Be clock by eroding away the top surface of the boulder and any Be that could have accumulated in the past. With this information, we are able to reconstruct the timing of glacial advance and retreat. Glaciers are directly linked to the climate, as seen by the current ubiquitous retreat of mountain glaciers in response to rising CO2. We can use the link between climate and glaciers to determine periods of warming or cooling thousands of years in the pasts. Knowing about the climate of the pasts helps us better understand the mechanisms that make Earth's climate system tick. 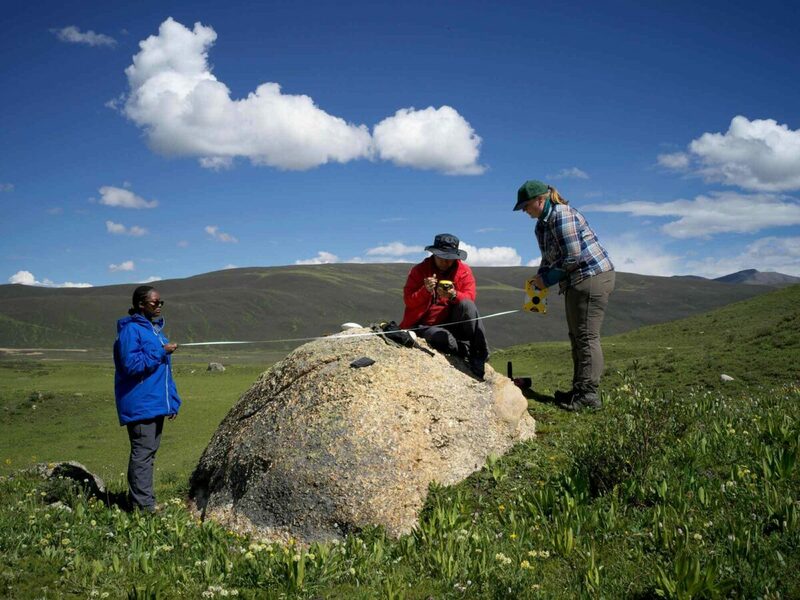 Maya Sheriff, Xianghui Kong 孔祥辉 and Jessica Stevens measuring a boulder from which samples were taken. Environmental Science Teacher Jessica Stevens chaperoned students from Gary Comer College Prep in Chicago to join Aaron’s team for two summers. 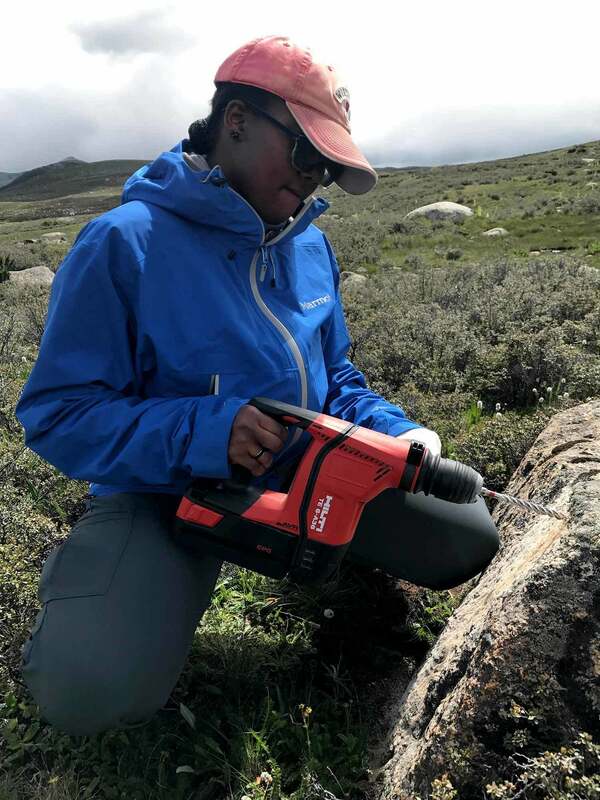 In 2016, Destiny Washington collected core samples from a modern day glacial field in Mongolia. 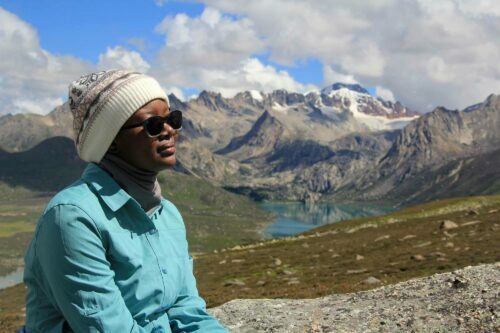 In 2017, Maya Sheriff studied the history of glaciers in the southeastern Tibetan Plateau during and since the last ice age. The trips were fantastic experiences for my students, and for me. I had traveled extensively, so it was most interesting for me to see new experiences through the eyes of my students. Destiny and Maya had never been abroad and they experienced so many new places, foods and cultures. Aaron and his team were so relatable, not only to me, but to our teenage students, and that made the trip truly enjoyable for them. My absolute favorite thing was seeing how proud Destiny and Maya were when they presented their research at the annual conference of the American Geophysical Union. Maya did amazing; she got over her initial jitters so quickly, which was impressive considering she's in high school and was presenting to people with PhDs and master's degrees. I'm so proud of her, she grew a lot this past year. My main role was to be a chaperone, but I participated in field work as well as ensuring Maya and Destiny were both happy and well. I'm looking forward to incorporating more of the trip in my class. Last year, my students analyzed Destiny's project to create their own evidence-based claim on climate change. This year, I will use Aaron's work as a case study. 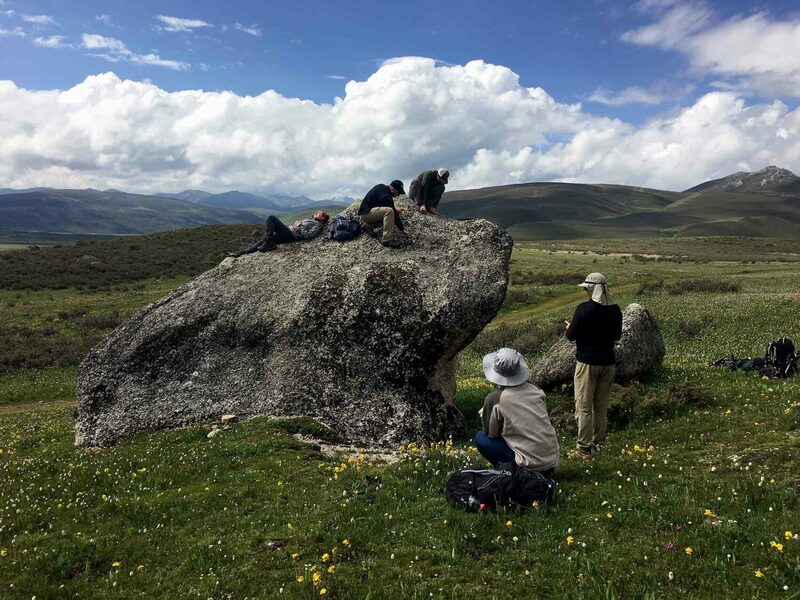 Since the trips, I have a solid handful of students interested in the natural sciences, and many of my scholars are starting to understand the importance of what we study. Seeing that Maya and Destiny participated in research and survived an extended period outdoors has made it more accessible. I still hear “Ms. Stevens, I'm not about that life,” but they are more open to the idea than they were before. It’s important to expose them to nature and science, so that they will care about our environment as adults. I want to make sure they have a chance to get used to the outdoors, and to understand that a spider isn’t going to kill them, that bugs aren’t gross, that plants are about more than just dirt. Our students have amazing opportunities with the Gary Comer Youth Center garden and farm, Green Teens trips to Yellowstone, and these field trips with the Comer Fellows. This is what will give us hope for the future. I learned that I am not only an intelligent young woman, but a strong one. I am proud of myself for being able to do the things that I have done on this trip. I had an experience of a lifetime. I got the chance to step out of my comfort zone and live in a different environment than I’m used to. I feel everyone should try it at some point in their life because it can really change your mindset. I expected to feel out of place or have a lot of attention drawn to me as an African American in China; a lot of people in China have never seen an African American person before, so I was a main attraction. At some moments I felt I should stay because I felt more loved there than back at home. I learned that I am not only an intelligent young woman, but a strong one. I am proud of myself for being able to do the things that I have done on this trip. I never thought in a million years that I would be able to walk and climb mountains, let alone mountains in China, without passing out from exhaustion. However, I climbed mountains and came back down with my health still intact. I learned more about how global warming is getting worse, and how it can be related to many problems the world is battling now. I also learned what 10Be cosmogenic-nuclide dating is and how it is used by scientists to determine glacier recession. Maya Sheriff spent three weeks working in the field before returning to Chicago to complete her senior year of high school. 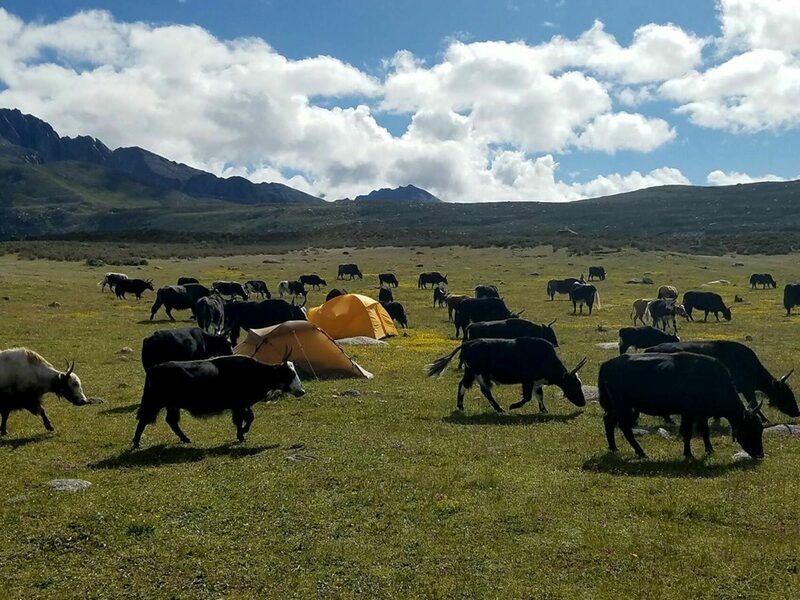 The Tibetan Plateau, China filmed and produced by Kelly Calagna. Scott Travis first met Gary Comer at Lands’ End in 1988 at a fulfillment problem-solving meeting. In 1993, Scott was the safety coordinator in Facilities Services when Mr. Comer asked him to manage the farm. Since then, Scott has done everything from building buildings, roads and runways to stirring the mushrooms he’s grown into a homemade risotto. Scott has participated in several field expeditions. In 2006, I was sitting next to Dr. Wallace Broecker at the Gary Comer Youth Center ribbon cutting. I asked how the Comer Fellows research programs were going. "Very well!” he replied. I answered, "If you ever need help, I would be happy to volunteer." Little did I know then that my offer would lead to working with some of the finest professors and brightest students that I will ever have the good fortune to know. In 2007, I joined Comer Fellow Aaron Putnam’s team in New Zealand. Aaron was beginning his PhD program. In 2016, he invited me to work with his field team in Mongolia. At sunset one evening, I watched Professor Aaron Putnam and his team hike up a large moraine to camp. 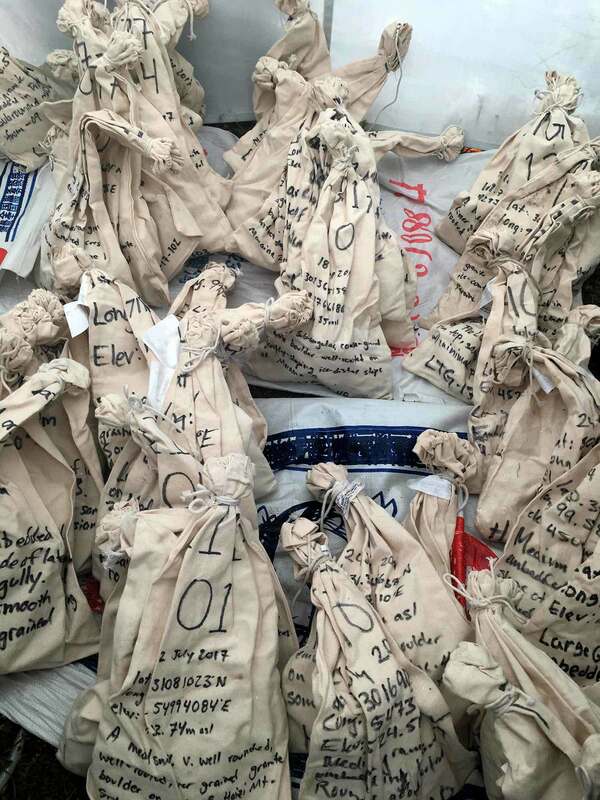 The team included one high school student, three undergraduate students, a graduate student, a doctoral student, and one journalism student (a Medill Comer Scholar.) 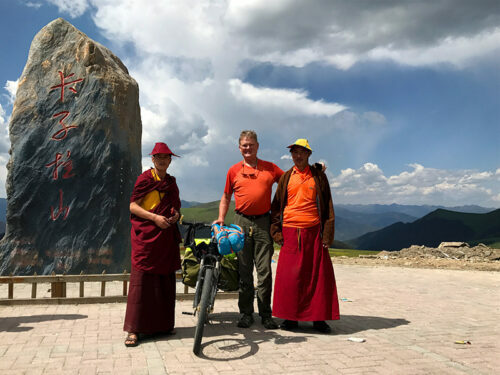 In 2017, the cycle continued in China as Aaron taught a new generation of students. It has been amazing to offer my assistance and to watch as the chain grows longer. 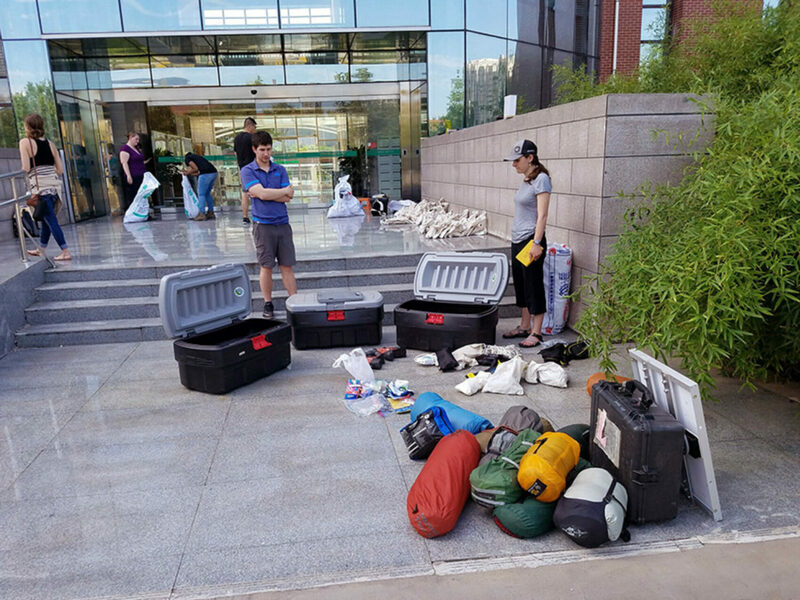 Organizing a research trip for ten people traveling over 14,000 miles for 5 weeks of field work takes months of preparation and planning. Applying for research permits, coordinating with international universities, visas, flights, arranging drivers and vehicles, lodging, gear, satellite communication, drones for mapping, batteries, generators to charge batteries, laptops and GPS units, tents, sleeping bags, first aid kits, supplies for sample collection and safe drinking water, and everything I forgot to mention. Awareness and preparedness are critical to a safe and successful field expedition. Ensuring that everyone returns home safely is the goal of every trip. Before travel, we request a health record from all participants. 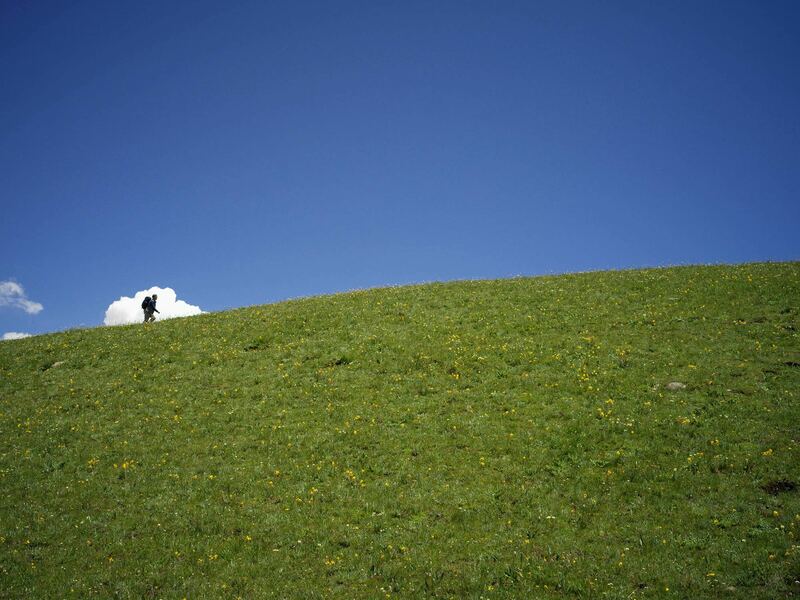 There is no access to emergency care in many remote field locations. This is not the time to find out about a physical condition that could jeopardize an individual, or worse, the entire research trip. Team leaders must be aware of all medications, allergies, physical limitations and prior injuries that could limit a participant’s ability to complete his or her field research. Even the best laid plans are subject to change. 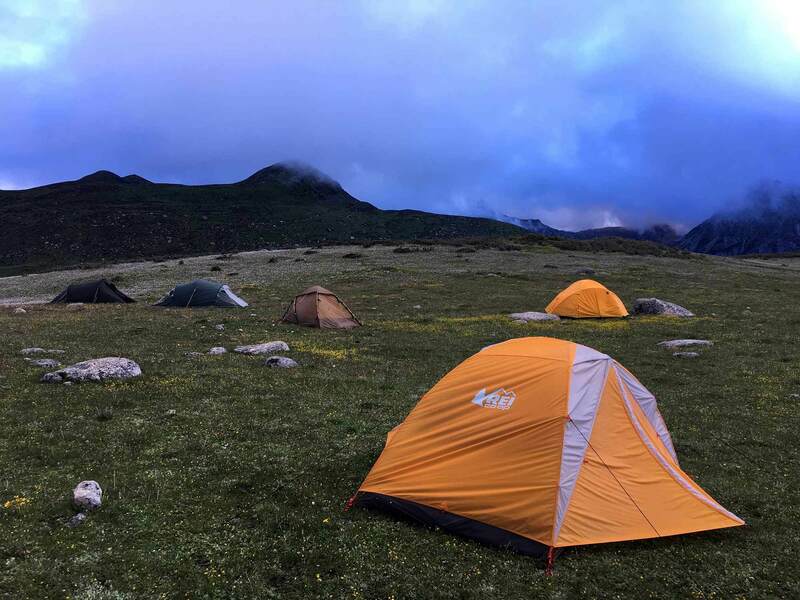 The day before we set off for our field site at 14,500 feet in the Tibetan Plateau, we discovered our plan to drive to a hotel for meals wasn’t optimal. 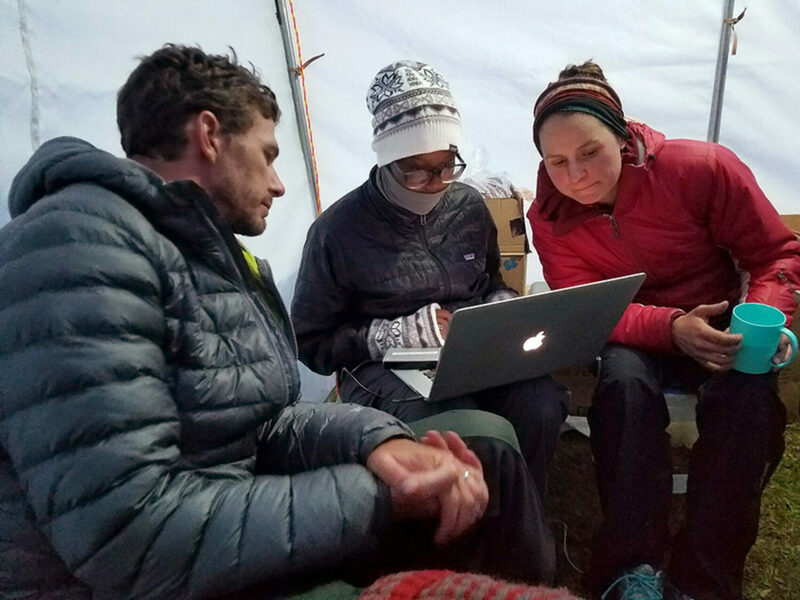 The research team needed to stay in the field so that they could work from daybreak to dark. The night before our departure, we decided on a Plan B. I can contribute here—I like to cook! We had our camping gear, but nothing for food preparation. What fun this scavenger hunt would be. 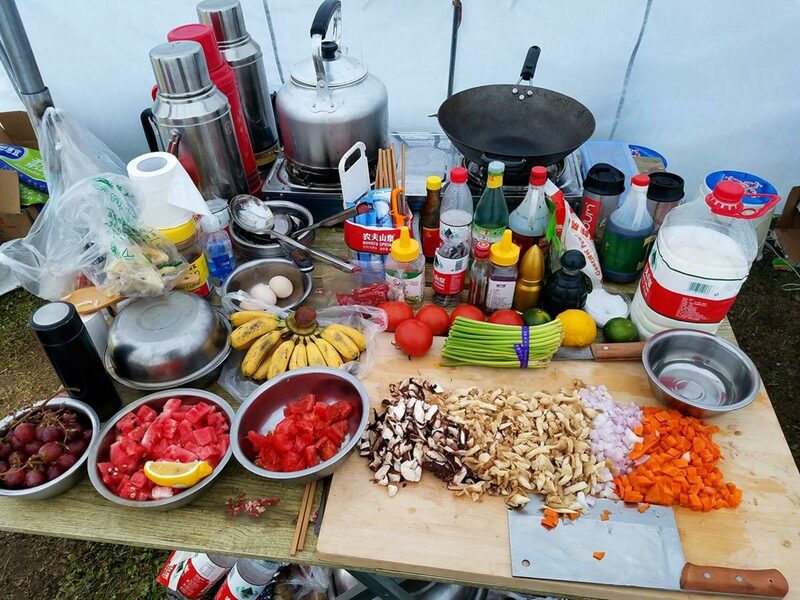 We needed a food tent, a stove, tables, utensils, large teapots to sterilize drinking water, woks, plates, bowls, silverware, buckets for hauling water, thermoses. We needed food for 12 people for 12 days by 11:00 AM the next day. I put together a menu and a grocery list. 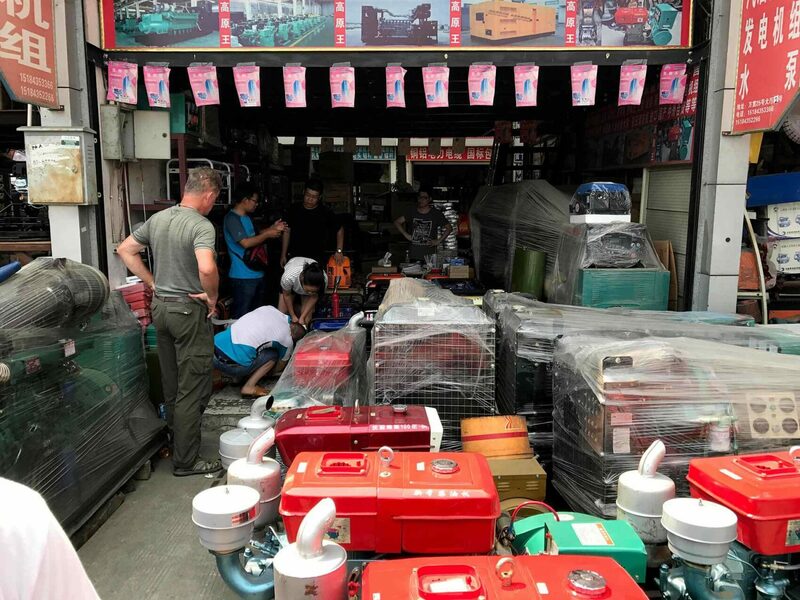 We set out for the market where, with Dr. Kong translating, we found everything we needed. 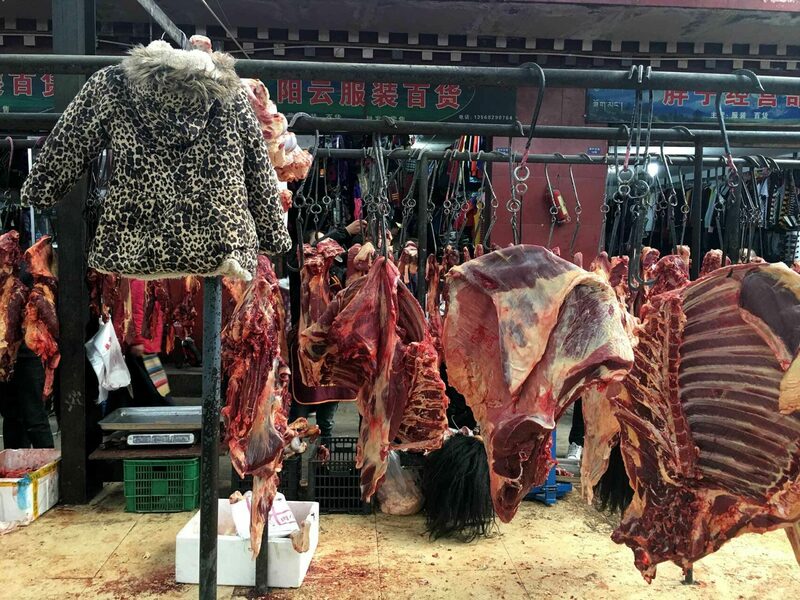 The market stretched for what seemed to be a city block of vendors. We bought tofu, cabbage, eggplants, daikon, carrot, fresh shitakes, enoki mushrooms, cucumber, tomatoes, peppers, peas, lentils, long beans, fresh noodles, rice, pork, beef, dried fish, soy sauce, sweet chili sauce, spices, nuts, breads, apples, oranges, bananas and 130 instant noodle dinners. We loaded the provisions into the gear van and headed down the road to camp. I was the new camp cook. Plan B accomplished! As an elder member of the group, I found that my life experience helped navigate day-to-day situations. I recognized an opportunity to enrich the experience for the students by encouraging them to take initiative, to work together, and to push their boundaries. I also know that lending a helping hand or a word of encouragement goes a long way. For a volunteer, this has been a rewarding experience, and more than I could ever have hoped for. “You’ve got to have plans A, B, C, D and then sometimes you get to G,” said Scott Travis. The National Science Foundation promotes the progress of science. Read about the Early Career award and Putnam’s research project. The Chinese Academy of Sciences researches climate and environmental change. Explore its progress and papers. Gary Comer College Prep is committed to students’ success in college and beyond. Learn about its rigorous approach. 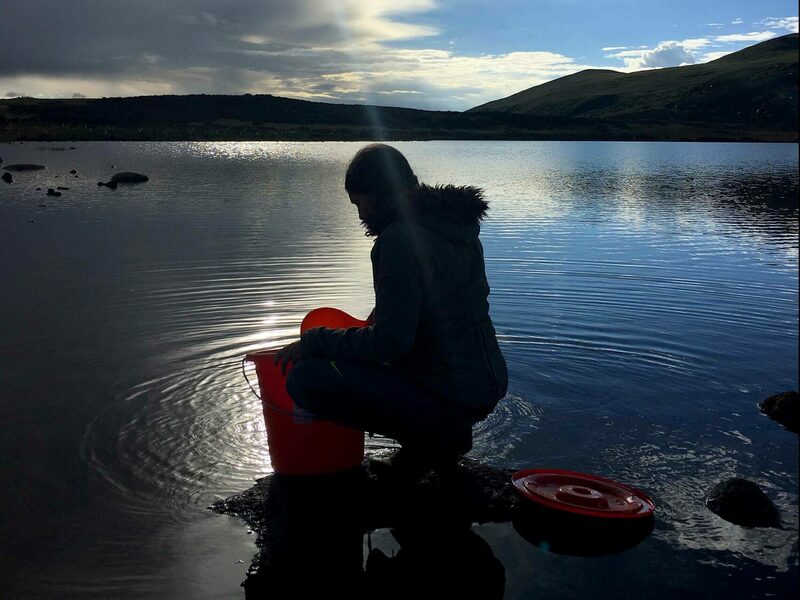 Medill graduate journalism students report on science and the environmental. Expand your thinking through their stories.